How good is the Celestial Nighthawk in Destiny 2? Show me what you need dead. In Destiny 2, it would be easy to argue the Hunter class is left behind by the Warlock and Titan classes. The Hunter class ability is selfish and not particularly useful compared to its counterparts. The Hunter is by far the squishiest between the three classes, and having maximum mobility is nothing compared to resilience or restoration. The Hunter leaves a lot to be desired, but one place that it excels is with the way its exotics pair with its super abilities, and the Celestial Nighthawk exotic Hunter helmet is the best in the bunch. Each exotic weapon or armor piece comes with an intrinsic perk that sets it apart from standard legendary gear. When players can configure their class and subclass so they complement the intrinsic perk of their exotic armor piece, that’s when you start to see real benefit. This is especially true with Hunters who use the Gunslinger subclass and the Celestial Nighthawk. 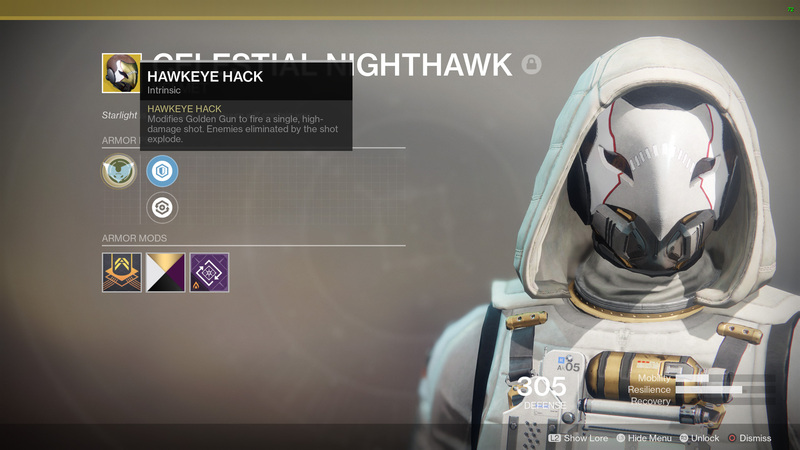 With the Celestial Nighthawk, the intrinsic perk is Hawkeye Hack. It modifies Golden Gun to fire a single, high-damage shot. Enemies eliminated by the shot explode. This single shot will do six times the damage that a shot from the normal Golden Gun can do. To be clearer, if your regular Golden Gun does 10K damage per shot, and you fire three, that’s 30K damage total. One shot from Golden Gun while you’re wearing Celestial Nighthawk will do 60K damage in that case. The other two perks the Celestial Nighthawk can be configured with are a Plasteel Reinforcement Mod or a Restorative Mod. You’re selecting between more health or faster health recovery, so choose the one that benefits your subclass build the most, but an in-depth breakdown of this is a guide for another day. Speaking of your subclass, it’s important that you use the Way of the Sharpshooter path when setting it up. Each precision shot with your Golden Gun while Way of the Sharpshooter is active will cause additional damage and create two orbs of light. This is essential in PvE, especially against strike bosses or Calus in the Leviathan raid. You should only use the Celestial Nighthawk exotic helmet when you’re using the Hunter’s Gunslinger subclass in a PvE activity. There is no need or room for the Celestial Nighthawk in PvP. Since the regular, non-Celestial Nighthawk Golden Gun can kill a PvP player in one shot, why increase the damage and reduce your number of shots? If you’re taking Golden Gun into the Crucible, consider swapping your Celestial Nighthawk for the Knucklehead Radar instead. Where you should use Celestial Nighthawk is almost anywhere you find a proper yellow-bar enemy in PvE. Think bosses in the game’s heroic public events, bosses in strikes and the Nightfall, and even Calus in the Leviathan raid. In fact, you can chunk Calus for more than 250K damage using the Celestial Nighthawk and Golden Gun when running the Way of the Sharpshooter path in your subclass. 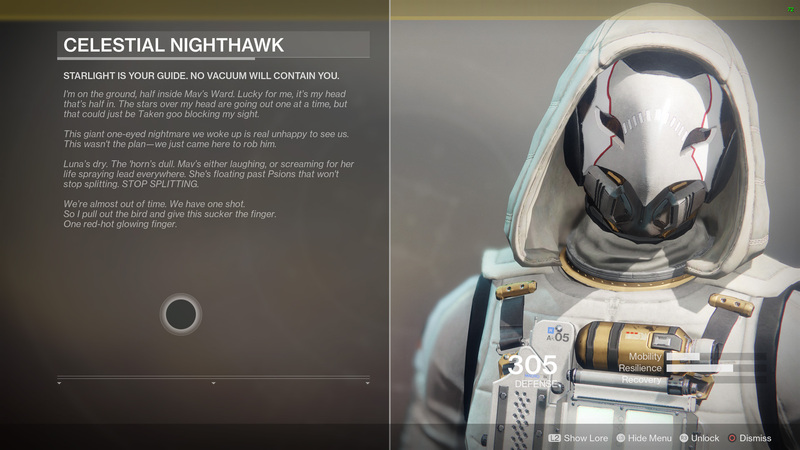 Seeing as how the Celestial Nighthawk doesn’t have a quest attached to it, the only way to get it is through an exotic engram, or by purchasing it from Xur. Since you never know when Xur will show up with what you want, it’s likely that you’ll get this through an exotic engram. Those can be quite unpredictable and infrequent, but there are ways to maximize your acquisition rate of exotic engrams. First, those heroic public events I mentioned are a good way to grind for an exotic engram, although once you get one, I’d be shocked if there wasn’t a cool down. Just look at how Bungie handled XP. You can also get a guaranteed exotic engram from one of the chests in the Leviathan raid underbelly. Complete all three challenges (Royal Pools, Pleasure Gardens and Gauntlet), then take your key to the required chest. One of the three should drop you an exotic engram. Players should also try the Nightfall or the Powerful Engrams that you get each week for completing Milestones. Even regular strikes can drop them. The Celestial Nighthawk, Golden Gun, and Way of the Sharpshooter are designed to deliver a huge amount of damage in an instant. This combination can kill a Nightfall boss at a quarter health, which means that you’re never out of the fight as the timer is ticking down and your super ability is close. Now that you understand the effectiveness of the Celestial Nighthawk, be sure to visit the Shacknews Destiny 2 complete strategy guide to get more information to help you on your journey, Guardian.